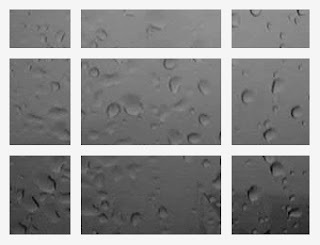 Wind and rain on the window pane, but this is actually a swiped image from some web cam. I doctored it with my cheap image editor. It's been winter with wind, rain and snow. My little room has been quite cozy in this downtown area. Lights seem to never go out here. An advantage of living among dense development. Not that many trees to fall on power lines and there are a lot of redundant circuits. If one goes down, they can usually switch to another. In the last wind, we did loose power, for about 5 seconds. I was at work which is just a few blocks from my residence. Outage wasn't even long enough to remove the afterimage of the brightly lit lobby from my eyes. Before the wind, I shut my home computer off at the strip. It doesn't need to be on 24/7. My web sites run on servers that are located back east and in California. These hosting corporations have fortresses with everything they need till Armageddon. Shared hosting, kind of like communal living. Yes, technological civilization has a certain amount of redundancy and resiliency. Agility is a good attribute as well. Being able to get around on foot. Living in a dense urban area, there were lots of restaurants and stores to choose from. Quite a few things did close during the snow, but there were enough places that I could always find something open. One time, I had to walk out to Lakeway Drive for a decent meal. That wasn't too bad. I needed the exercise anyway. My little rented room doesn't have much space to stash things. I can't really afford to be a survivalist. With practically no food stored at home, I rely on my agility to get around and the fact that there are so many restaurants and stores in this downtown area. Hard to imagine them all being closed. Being single makes it easier to get around as well. That's my lifestyle, traveling lightly in the heart of an urban core. Some other folks stock their homes with lots of food, auxiliary generators and so forth. Sometimes things like generators can be more of a hassle. I hear of problems with fumes and even fuel storage fires. Still, it makes more sense to try this in rural areas where services are farther away. It wouldn't make sense with my lifestyle. I do have a portable radio with batteries. My bike light and camping gear could work for a short while if needed. The radio can go with me where ever I go. It has been interesting listening. KOMO radio's "neighbor to neighbor" coverage has been good. The most recent wind was a lot harsher just south of here. I have to count my blessings. The storms have just been interesting things to watch and follow on the news for me. That's my lifestyle. Not having many things to worry about, having a lot of agility and being close to a lot of urban services. Conservatives might laugh during the snow and say, "where's the green house effect?" Liberals might say, "it's really climate change and some areas, like northern Europe could get colder." Well I say, it's just a normal winter. We have gotten wind, rain and some snow, other years. It's just that we have had quite a string of "milder than normal" winters recently. Maybe the milder than normal winters have been related to global warming so when we have a normal winter, it seems abnormal. A perception incubated in global warming. Really, there is never a normal year for weather. That's because "normal" is only a "many year" average. Random weather fluctuations are always either "warmer than normal," or "colder than normal," or "wetter" or "drier." One can be philosophical about the concept of normal. Most things aren't really normal. Things are always unique. "Normal" is only the sum total of things over a long period. Remember, that is true for people as well. Us, abnormal folks, (abnormal in many directions) are really the majority. I've probably lost you all by now. Anyway, hope you are surviving the winter.